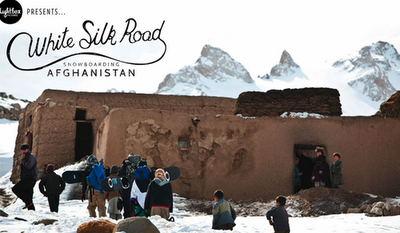 White Silk Road tells the story of three Australian snowboarders who travelled to Afghanistan in February 2012 to carry the sport across new frontiers. The guys, Clint Allan, Nick Gregory and Mitch Allan, must be very brave and a little crazy. They must also have paid a huge sum for travel insurance. They travelled to the town of Bamyan, in central Afghanistan, to explore the untouched peaks of the mighty Hindu Kush. Along the way they dodged riots, landmines, bombs and kidnappers to discover a side of the country usually ignored by the western media. The spectacular natural beauty of Bamyan has endured through centuries of violence, and a culture of hospitality and optimism in the communities has prevailed through the previous decades of conflict. The snow-capped peaks of the Hindu Kush tower above the small town. All winter, they are covered in deep, dry powder. Most of them had never been ridden. With only their two legs to get them up the mountain, the snowboarders set about changing that. In the foothills of the mountains, the riders met a small group of locals who had recently taken to the slopes with gumboots and wooden skis: forgetting the tribulations of the past and fostering a new tourist industry that could secure a brighter future. The boarders introduced them to snowboarding and helped them learn the fundamentals of a new sport and a new life. It opened in Australia in July and will be playing at festivals in North America and Europe later in the year. The trailer below [2 mins] is extraordinary. Just look at those mountains. The soundtrack is put together by Fake Four Inc and Circle Into Square. November 2012 update: You can now purchase the DVD online. My copy arrived today: it is thrilling and the landscape wondrous. White Silk Road: Snowboarding Afghanistan - Trailer from Lightbox Pictures on Vimeo.